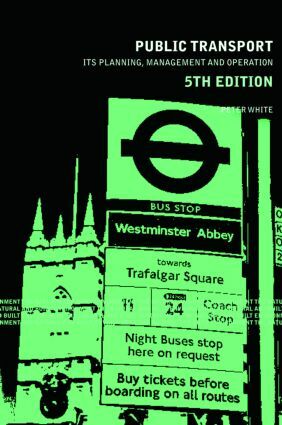 Public Transport is a comprehensive textbook covering the planning of all public transport systems (bus, coach, rail, taxi and domestic air travel) in Britain and other countries with similar systems. The term ‘planning’ is used both in the context of local authority and central government roles and in the work done by transport operators for example, network structures, vehicle type selection. In addition to the various types of transport, the differing needs of the urban, rural and long distance markets are examined. This restructured new edition gives greater emphasis to service quality and marketing issues as well as covering recent changes in legislation, statistics and research findings. Public Transport is of particular interest to transport planners in local authorities and consultancies, managers in transport operations, as well as undergraduates and MSc students of transport planning and those studying for the membership examinations of the Chartered Institute of Logistics and Transport.